IIFYM, or “If It Fits Your Macros” is a diet that takes macronutrients into consideration for your weight goal. There are three major macronutrients that the human body needs in order to function properly: carbohydrates, protein, and fats. 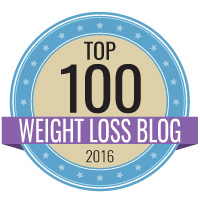 Essentially, this diet is providing the body with exactly the macronutrients it needs for your goals–whether that be weight loss, maintaining current weight, or bulking/weight gain. 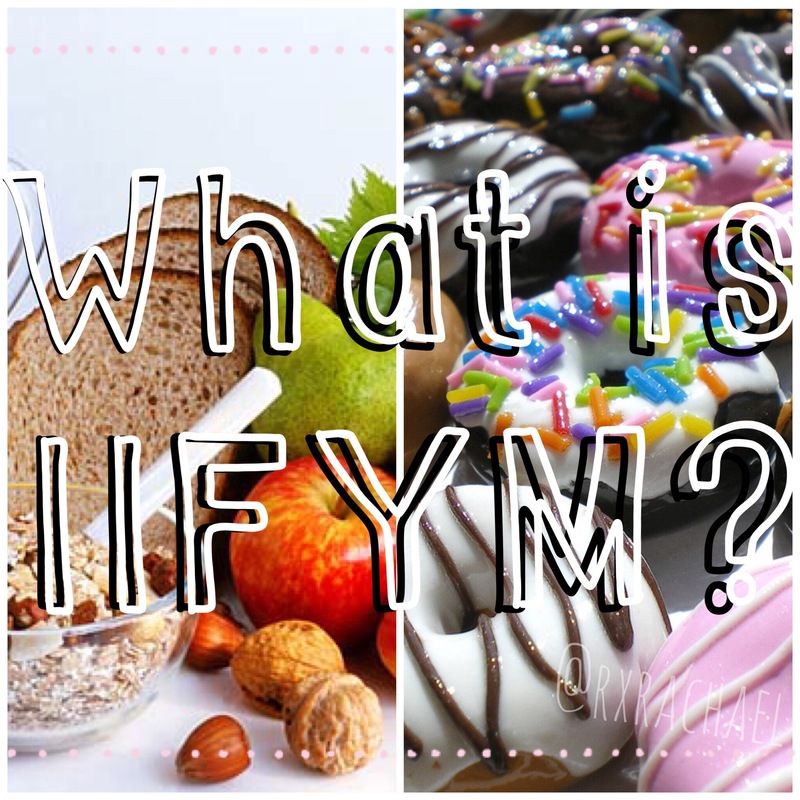 IIFYM is sought after for its ability to be flexible and nonrestrictive when it comes to the foods you can consume. Nothing is off limits if it fits into your macros. What’s a macro? One gram of each macro has a calorie value. In order to start, you must calculate how many calories and macros you need for your goal weight. Check out o ne of these two calculators to help you: Macro Calculator or the MacroFit Calculator . These calculators will give you your daily total number of calories and macros. You can find out your TDEE and macros by hand with different formulas which you can find online, but using these calculators are pretty fool proof. Keep in mind, these calculate your daily calories and macros WITH EXERCISE ACCOUNTED FOR. This is why it asks about your level of activity each day. It is taking your BMR, or your basal metabolic rate (The number of calories your body burns on a daily basis just by existing) and factoring in your activity to give you your TDEE, or Total Daily Energy Expenditure. Once you have your daily goal, now you just have to begin by logging your food. THIS BEING SAID, YOU DO NOT EVER SUBTRACT YOUR CALORIES BURNED FROM YOUR TOTALS! Meaning, just because you burned 500 calories on the treadmill does not mean you get to go “eat them back” and add 500 additional calories to your totals! Anyway, When you begin IIFYM, you have to begin to log and measure your food for this system to work and be accurate. This is the hardest and most tedious part. YOU WILL HAVE TO BUY A FOOD SCALE. After about a month of measuring and logging you will start to know what serving sizes of foods are just by eyeballing, but the best way for accuracy is to measure, measure, measure! Find a calorie/macro tracking app that works for you. Personally, I use http://www.myfitnesspal.com Its the only app I’ve ever used and I’ve never turned away. 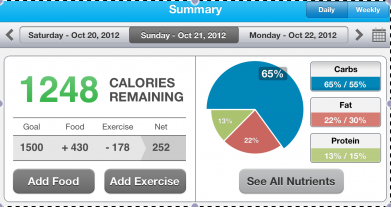 It provides you with calorie counting AND your macros. You are able to see how your macros are broken down each meal, how many grams of each you have remaining for the day, and it even offers a visual pie chart showing your macro ratio percentages. That being said, a calorie is a calorie, your body will burn 250 calories of Pizza the same as it will burn 250 calories of chicken, avocado, and rice. BUT, trying to eat nothing but processed junk food even if it fits in your macros is stupid. Our bodies are also supported by MICROnutrients–these are your vitamins and minerals. 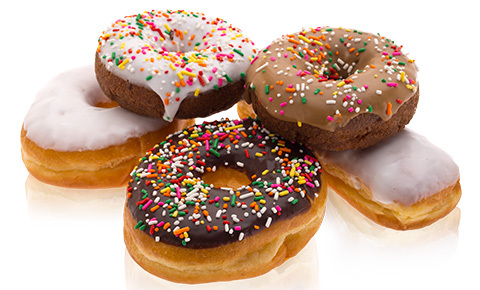 Fruits and vegetables are rich in micronutrients—candys and donuts, not so much. Make sure at LEAST 80-90% of your food is nutrient dense, healthy food! This is why I link IIFYM and clean eating together as the same diet, because you need to utilize the same principles as eating “Clean” 80% of your diet. This will help supply your body with the nutrients it needs, but also will improve your performance at the gym. Still confused? Okay, let me give you an example using numbers– it may be easier to understand that way! Say I find out that in order to cut weight–not aggressively– I should eat 2050 calories every day. 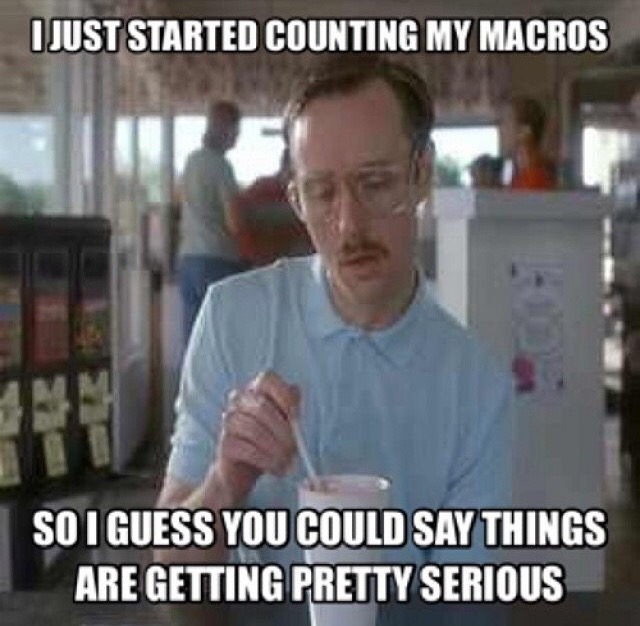 My Macros to hit for fat loss are 40% Carbs (205g) 35% Protein (179g) and 25% Fats (57g). I could separate these into the amount of meals I want to eat per day and eat the same ratio of carbs/proteins/fats each meal. If I only eat 3 meals a day: Each meal needs to be 683 Calories, 68g carbs, 60g protein, and 19g fats. If I eat 6 meals a day: Each meal can be 342 calories, 34g carbs, 30 protein, 10g fats. You do not have to eat the same exact thing for every meal, this is where you tweak your foods and swap out chicken for steak, and oatmeal for cereal according to the numbers. If this is the route you choose you will have to plan ahead. This is for the Type A, OCD type person. You will carefully calculate your numbers and meals ahead of time and know what exactly you will be eating for that day. This is NOT me, I eat based on how I am feeling–and then I watch my calories and macros and base my meals accordingly. I do not eat the same ratio every meal, I just make sure my macros are filled by the end of the day. So, if I have a high carb breakfast, I make sure my next meal is high in protein. I continue to add what I need to each meal until the end of the day— at the end of the day I just make up were I’m lacking. Sometimes this allows me to have a S’mores Poptart when I’m short on carbs and fats (I LOVE THESE DAYS) other days, greek yogurt or cottage cheese to get additional protein. It is not always perfect, but I am ALWAYS damn near close to my ratios and I’m getting better each day. There is no perfect macro ratio. I have read that the “best for fat loss” is 40/40/20 (this is near what I follow at 40/35/25) but everyone will react different and it may take a little tweaking and tinkering before you find your perfect ratio. I hope this helps, if you have additional questions or comments please post away! Thanks for the info! Easy to understand! Definitely made all of it easier to understand! Great article! Thank you!